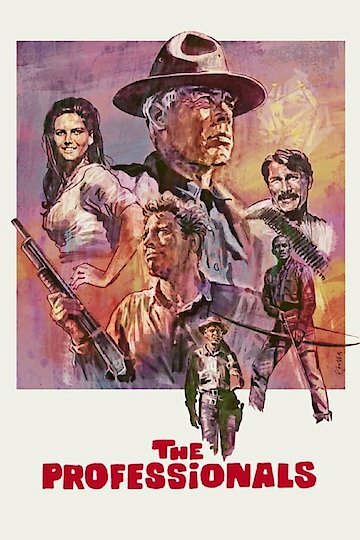 The Professionals is a gritty Western of epic proportions starring Burt Lancaster, Lee Marvin, Claudia Cardinale, Robert Ryan, Woody Strode, Jack Palance and Ralph Bellamy. It is based on the novel A Mule for the Marquesa by Frank O'Rourke and nominated for three Academy Awards (Best Director, Best Writing and Best Cinematography). In the late days of the Mexican Revolution, wealthy rancher and oilman J. W. Grant (Bellamy) must hire four mercenaries to rescue his kidnapped wife Maria (Cardinale) from a vicious bandit and former Revolutionary Jesus Raza (Palance). The four men are all paragons of their fields: the weapons expert and team leader Rico Fardan (Marvin), an explosives technician (Lancaster), an expert horse wrangler (Ryan) and a reconnaissance scout with finely honed Apache skills (Strode). Despite their admiration for Raza's skills as a Revolutionary, they are determined to successfully complete their mission. After tracking Raza's men and under the cover of darkness they rescue the kidnapped wife only to find that all is not as it seems. Maria is not the terrified victim of kidnapping that they men were lead to believe, now they must contend with both Grant and Raza and decide who is right during these tumultuous days. The Professionals is currently available to watch and stream, buy on demand at Amazon, Vudu, Google Play, iTunes, YouTube VOD online.